With endless green spaces and tree lined avenues, Clapham Park is a special place to socialise, play and relax at the heart of the city. Integral to this is The Crescent, a circular enclave located at the focal point of Clapham Park. From yoga and picnics in the sun, to resting and reading in the shade of an oak tree, The Crescent provides a tranquil and open place to unwind and be at home outdoors. Wide avenues, pedestrianised networks and designated cycle paths lead the way to a sustainable future for being on the move and getting around Clapham Park. The newly-developed supercrossing at the head of Tilson Gardens is not just a key gateway for such travel, but also a community-centric space that will be home to outdoor dining and occasional markets; offering worldwide cuisine, hand picked stalls and plenty more besides. For children and young people, Clapham Park offers a number of outdoor spaces for activities, exercising and games. As well as playgrounds, open lawns and community gardens for younger children, young adults and older children can utilise one of two sports pitches. These areas provide the perfect designated space for keeping fit, getting competitive and having fun, with facilities for a range of ball games. For both residents and users of the sports pitch, noise and disturbance will be minimised by its thoughtful design and open location. 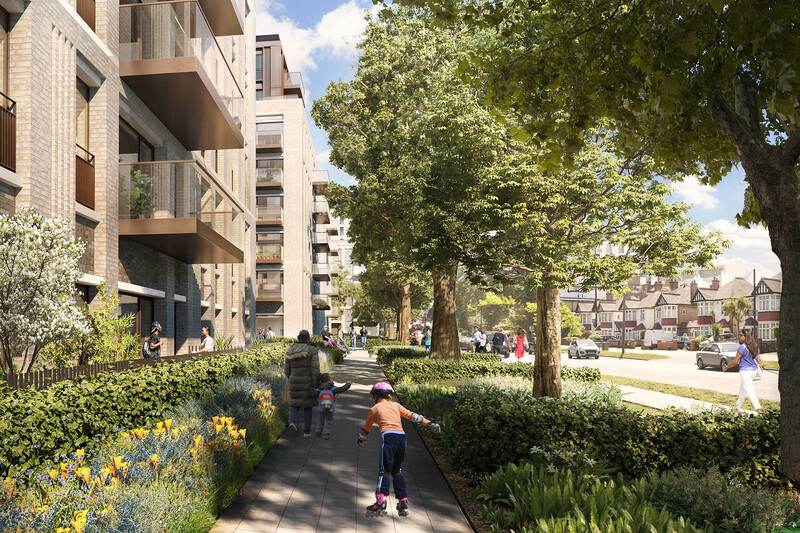 Along with the close-by Crescent, Central Park is the centre-piece of Clapham Park, with its green walkways and open space running through the heart of the development and complimenting offshoot pocket parks and tree-lined avenues. The ample space offers opportunities for both community and commercial uses, with sun trapped lawns and shade filled corners providing the ideal place to socialise with friends and spend time with family. Aside from the existing high quality housing stock within the wider surrounding Clapham area, there is a wealth of inspiration which can be taken from the master builder and developers of the 18th and 19th centuries, such as Sir Thomas Cubitt. The key to Cubitt’s masterplans of London is in the way buildings were elevated and how distinct areas of different character were created within larger developments. Historical elevations demonstrate how he created a feeling of richness and variety in a single area. This ethos has been replicated by using a very standardised approach to how the modern elevations have been designed. The Cedar Buildings which sit at the northern end of Clapham Common provide a timeless precedent for the mansion block typology which will be utilised at Clapham Park to deliver a mid to high density, street based masterplan.